Space features 12 of Eventide's signature reverb combination effects culled from the H8000FW and Eclipse V4 along with some startling new magic. Space includes 100 presets, including presets crafted by Flood and Alan Moulder (The Killers, Nine Inch Nails, Smashing Pumpkins, My Bloody Valentine, 30 Seconds to Mars, PJ Harvey and Them Crooked Vultures), Justin Meldal-Johnsen (Beck, Nine Inch Nails), Richard Devine (sound designer, synthesist, performer, remixer), Vernon Reid (Living Colour), Amedeo Pace (Blonde Redhead), Alex Somers and Jonsi Birgisson (Jonsi and Alex, Sigur Ros), Amadeo Pace (Blonde Redhead) and John Agnello (Patti Smith, Sonic Youth, Dinosaur Jr., and Kurt Vile). 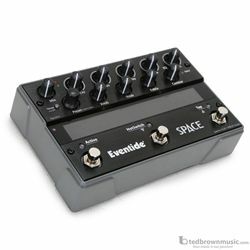 These unique effects, previously available only in Eventide rack processors, are now available in a compact, roadworthy package. Never before has there been a more dazzling collection of reverb algorithms combined with delays, pitch shifting, tremolo, modulation, and spatial effects in such a compact and affordable package. Eventide stompboxes are available at your favorite authorized Eventide dealer.